“Our supplies dwindle. Our trade routes shut down. run red with the blood of our fallen enemies! tell their fellows the fate they met at the hands of the Daggerfall Covenant! 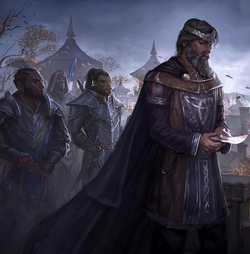 ·Emeric was originally a merchant lord from High Rock. His shrewd policies and masterful diplomacy helped establish an alliance with the Redguards and a war treaty with the Orsimer promising their homeland provincial status. This earned him the trust of the kings of High Rock and he rose to the position of High King. ·He rules from Wayrest in High Rock.